1 custom made box protector for the Funko Speeder Bikes. These fit Luke, Leia, Scout Trooper and Ewoks Speeder Bikes. 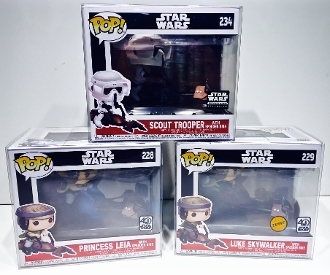 These do NOT fit the smugglers bounty Luke with Speeder or the Rey with Speeder but we have those sizes also. Rey with Speeder is the "New" Rides size with the TMNT Van in the pictures.